The Ubiquiti Networks AirMAX Omni 2x2 Dual Polarity MIMO Antenna is designed to be compatible with an optional Rocket M BaseStation to deliver 360° wireless networking. This dual-polarity antenna operates under the 5 GHz frequency and offers a gain of 10 dBi. It delivers 2x2 MIMO performance and supports airMAX technology, which uses a Time Division Multiple Access protocol to send and receive data at pre-designated time slots. Ubiquiti has outfitted the antenna with a robust mechanical design that helps ensure outdoor survivability. Included along with the antenna are a pole mount kit, Rocket M bracket, and weatherproof RF jumpers to make your base station building experience easier. Products that are received by WE LOVE TEC in any of the following conditions are not eligible for return and may be rejected. Any product that does not exhibit the described reason for the return i. A return initiated for a DOA product that powers on and works properly upon inspection. Any product from which the UPC code has been removed from its packaging. Any product that exhibits physical damage. Any product which appears tampered, customized, or altered in any way. 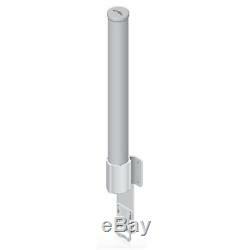 The item "Ubiquiti Networks AirMAX Omni 2x2 Dual Polarity MIMO Antenna" is in sale since Thursday, April 12, 2018. This item is in the category "Computers/Tablets & Networking\Enterprise Networking, Servers\Directional Antennas". The seller is "we_love_tec" and is located in Miami Beach, Florida. This item can be shipped to United States.